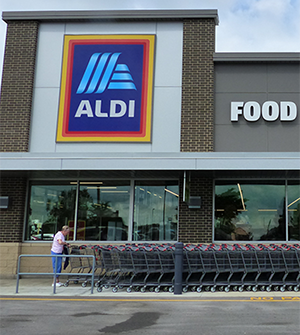 Aldi’s aggressive U.S. expansion will turn up the heat even further on grocery retailers looking to compete on value and convenience, industry analysts say. It has already been widely reported that Aldi has compelled retailers of all stripes selling groceries—notably supermarkets and mass merchants—to rein in pricing when the hard-discount chain opens stores in their market areas. But now Aldi is delivering a one-two punch. The company plans to add 700 more stores over the next four years, which will bring the retailer into more U.S. markets and give it 2,500 stores overall. It also has begun a major drive to improve the shopping experience, including more space for fresh, natural and organic offerings plus a wave of new products. “Consumers enjoy shopping there, because not only do they get value but there’s also an element of discovery. They’re finding things that are really meeting their quality expectations at a price that others are having a hard time competing with,” said Shelley Balanko, senior vice president of business development at The Hartman Group, a food industry consulting agency. “[Aldi is] renovating stores so the shopping experience is better, and their smaller store size in comparison to big-box retailers and large grocery stores is easier to navigate for consumers who are often very time-pressed. “Experientially, Aldi is delivering on some things that traditional grocery retailers haven’t been offering,” she added. In a study released earlier this year, data analysis firm IRI found that new stores are spurring U.S. consumers to try Aldi, with 40 percent of first-time shoppers saying they wanted to experience a new store. Customers also like what they see: Eighty percent reported high satisfaction with their experience, and 84 percent said they will shop at Aldi again. 66 percent cited good/affordable prices and good value. 49 percent said good product quality and variety, including fruit, vegetables and other fresh items. 25 percent cited convenient stores, including easy navigation, quick shopping trips and good locations. 20 percent had a strong impression of the store environment, such as cleanliness and wide aisles. “Aldi already has good value for the money; they already have high perception of product quality; they have the convenience factor; and they’re improving fresh products and meat, which is a key driver. When they improve the store experience itself, that could be pretty formidable,” said Fernando Salido, executive vice president of consumer and shopper ma rketing solutions at IRI. The average shopper basket at Aldi is $40 or less and contains 16 to 25 items, according to Salido. “They have convinced consumers that their products are high quality for a low price. And their basket has been traditionally 10 percent to 15 percent lower than other grocers—lower than Walmart,” he said. 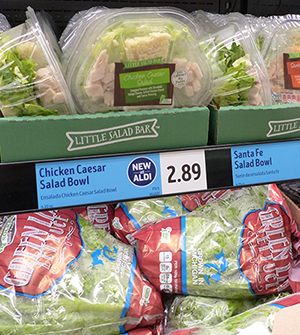 In a two-year analysis of one central U.S. market, IRI found that Aldi consistently had the lowest price compared with the total market’s average price for a representative basket of high-volume categories. During the study, which finished at the end of 2017, Aldi’s market share rose 0.8 percent, while conventional supermarkets held market share with pricing near the market average. One mass retailer kept pricing near the average and gained 1.1 percent in share, while another apparently had significantly higher prices and lost 1 percent share, Salido said. All other retailers had relatively lower prices than the market average but perhaps not enough to retain shoppers, and they lost 1.3 percent in share, he reported. Data from Earnest Research also showed Aldi snaring more grocery spending dollars. From the start of 2016 through July 2018, Aldi carved out slightly more market share and swayed shoppers to shift at least some spending. The research was conducted in the Minneapolis-St. Paul-Bloomington, Minnesota, and Dallas-Fort Worth-Arlington, Texas, core-based statistical areas (CBSAs), where Aldi faces competition including Albertsons Cos., The Kroger Co., Supervalu, Hy-Vee, Trader Joe’s and Whole Foods Markets.